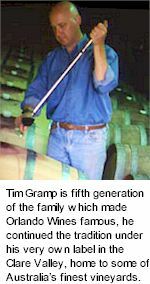 Tim Gramp is fifth generation of the family which made Orlando Wines famous. Tim has continued the tradition under his very own label, his estate wineworks are fortuitously based in the Clare Valley, home to some of Australia's finest Riesling vineyards. Tim Gramp is fashioned to a classically dry Riesling style. The palate is smooth and integrated, with a touch of intensity, elegance and refinement, ahead of a lingering, dry finish. An immensely well received and highly lauded wine to be found in Jetstar international business class. Fruit is sourced from the Castine family Golf House vineyard at Watervale. Soil profiles are red loam over limestone, yielding just over two tonnes/acre. Watervale is famous for Riesling wines with uplifted floral/ citrus aromas, clean mouthfilling flavours and profound structure. Idyllic ripening conditions develop pronounced, identifiably regional expressions. Parcels of the finest quality fruit are treated to a traditional manual basket press for the retention of inimitable hand extracted fruit characters. Only the exclusively free run juices are vinified, fermented over the course of several days, cold stabilised, filtered and bottled in July. Pale light straw colour. A vital clean bouquet, the classic dry style of Riesling with seductive lemon, lime and floral aromas. Zesty and elegant citrus components follow through onto the palate which displays refreshing acidity and superb length of flavour. Evocative citrus characters are balanced by an invigorating acidity and lingering clean mineral finish.